If you want to become a welder in Oklahoma, you should begin with making some research. Learn some welding basics and look for available training programs. It can be absolutely time-consuming so we’ve decided to save your time and prepare some useful data for you. 1.2 Welding: What Is It? 1.4 Where Can Certified Welders Work in Oklahoma? Before making your mind, you need to learn some welding basics and facts about the job in Oklahoma. That’s why we’ve prepared for you some useful info. Working as a welder in Oklahoma, you can earn a median salary of $44 040 which is $21.70 per hour. A median salary throughout the country, at the same time, is $39 390. Speaking of the top 10% of welders in Oklahoma have a salary of about $62 230 while the top 10% of welders throughout the country earn about $62 100 per year. Where Can Certified Welders Work in Oklahoma? There is the whole bunch of industries where certified welder can work in Oklahoma. You just need to look for alternative careers in Oklahoma. In fact, everyone has its own reason to choose a certain career. Of course, it’s true for welding as well but still, there are some reasons that are common for almost everyone. To begin with, you should know that welding has an excellent outlook. It means that you’ll be able to find your employment easily. Moreover, the number of welding careers offers are going to grow constantly in the future. One another point is that this career is absolutely rewarding and fulfilling as you can be proud of the work you do. Finally, there is a great variety of job offers for welders. You can work in various industries performing a number of duties. 4c Welding & Industrial Center, Inc. is located in Hugo, Oklahoma. Eastern Oklahoma Vocational Center is a part of the Eastern Oklahoma County Technology Center. 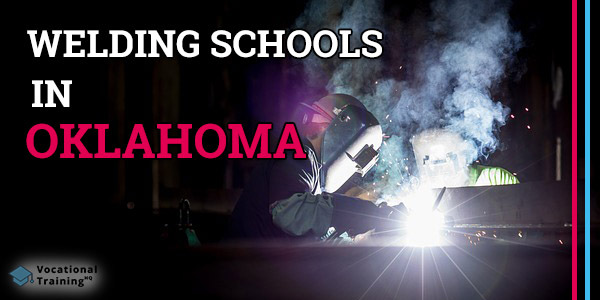 Gordon Cooper Vocational Tech School is in the list of the best welding schools in Oklahoma. If you want to learn about the programs available there, just visit “Career Majors A to Z” page. Great Plains Technology Center provides one of the best welding classes in the state of Oklahoma. Guthrie Job Corps Center offers 8-12 weeks Advanced Technology Welding program. Meridian Technology Center is located in Stillwater, Oklahoma. It has two welding programs: Welding I & Welding II. Mid Del Technology Center has the Structural Welder program that has classes on six main welding methods and requires 840 credit hours. Mid-America Vo-Tech is an excellent welding school but still, it doesn’t provide financial aid. North West Tech has great welding program, offers financial services and career counseling. Pioneer Technology Center is one another great tech center in the state. It offers a wide range of training programs. Red River Technology Center is located in Duncan, Oklahoma. Tri County Technology Center has a retention rate of 92-97%. Wes Watkins Technology Center has 4 welding programs. Moore Norman Technology Center is one of the best welding schools in the state of Oklahoma. In the table below, there is contact info of the schools listed above. At the moment, Tulsa Welding School (TWS) provides two main programs in their facility in Oklahoma. Now, as you’ve got all the important info about welding, you can make a final decision. Make sure you’ve checked the info about welding schools in Oklahoma and just start moving towards your goal!